What do you do when you get up on a grey and wet Saturday? 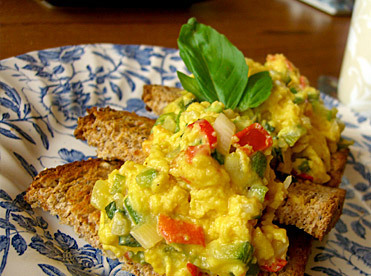 Make a breakfast full of sunshine! I got up this morning and it was the worst kind of start to a weekend. The sky was gunmetal grey, the light looked ominous and I could hear the gentle pitter patter of rain against the windows. As I walked into the kitchen to put the kettle on I spied two juicy peaches and started to think what I could do with them. As Dom was going to the gym after breakfast I knew that a peach alone, even if I poached it in rosewater and served it with Greek yoghurt…mmm… it wouldn’t be enough. So what else to do? And then it came to me. Roasted peaches with American pancakes and maple syrup! I first had American pancakes in a proper American diner in San Mateo, California in 1998 and have never forgotten the experience. Now don’t get me wrong, I love a crepe and pancake Tuesday is always celebrated at our house, but there is something really satisfying about their American cousins that I just love. Light and slightly stodgy at the same time and usually with the addition of maple syrup and some sort of fruit, blueberries, raspberries, I am not fussy. Firstly, halve and stone the peaches and then cut into eighths. Put on a baking tray covered with foil or baking paper and sprinkle with unrefined caster sugar. Not too much, maybe a scant desert spoon for the lot. Put in a preheated oven, maybe 175 degrees C and cook until they have gone slightly caramelised and a mixture of puckered and shiny. Remember to turn after about 20 mins – takes 35 mins in total but keep an eye on as depending on how ripe your peaches are will take longer/ less time. Mine were firm but with some yielding. For the pancake batter, mix all ingredients with a whisk or in a blender until completely smooth. The batter should be thick but capable of being poured/ dolloped. Heat a frying pan. We have a tefal pancake pan which is good as it has no edge and therefore it is easy to get your spatula underneath the pancakes when it’s time to turn. Don’t even try to flip American style pancakes, it will ruin your day before it’s properly begun and we wouldn’t want that now would we? Oil the pan and get making the cakes. You need enough mixture to make a pancake which is about 10cm in diameter. Cook on a medium heat. You’ll notice that air bubbles will start to appear on the raw side of the pancake in the batter. When there are many of these and the cake is looking golden around the edges then carefully, using a spatula, flip over to the other side. Cook for another 2 mins or so until you feel the pancake is cooked through. 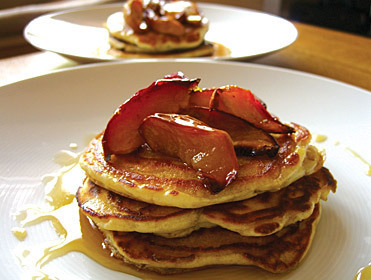 Once all you pancakes are cooked (you should get about 6 out of this recipe) then stack on plates, top with the roasted peaches and a generous slug of maple syrup. Whatever the weather is doing, you’ll have sunshine and thoughts of California inside and that’s what counts.